NOAA's August global SST record is the result of one data set | Watts Up With That? The world’s ocean surface temperature was the warmest for any August on record, and the warmest on record averaged for any June-August (Northern Hemisphere summer/Southern Hemisphere winter) season according to NOAA’s National Climatic Data Center in Asheville, N.C. The preliminary analysis is based on records dating back to 1880. September 17, 2009 in Oceans, Sea Surface Temperature. Can you blame NOAA for doing this, hey they want their cut of the global warming taxes. How did they determine that the satellite data was biased, and not the other data source(s)? Or were the simply cherry picking the data sets to confirm their own “observer” bias? Scuse me for asking, but what kind of BS graph paper are they using; that looks like some kind of phony logartithmic x axis scaling. The graph looks phony to me too; more like a tide plot, with one large tide, and an intervening smaller tide, so what do they attribute that to. Of course it is impossible to tell with that graph paper axis. Does anyone have the original raw data; that data set seems to be suffering from sampling inadequacy; I’m getting a bit tired of data that is improperly sampled. I guess my comments refer to their figure 1. I linked to your post from tAV earlier. But the JAXA ice line is nicely heading fro 2005; and look at that 2 1/2 somersaults the arctic temperature dive is doing. I guess those Walrussians knew when to get out of the water, while the going was good; they might have been iced over if they had waited. When are the NOAA climate scientists going to be “adjusted for bias”? Phony or not, I don’t see anything but Cartesian coordinate graphs, here. Please tell me you contacted them so they can “fix” their mistake? We have had satellites in space since the 1960s that can read a newspaper over your shoulder, peer inside storms, and measure the tempurature of your coffee. No use relying on them to plot daily temps, however. That is left to reliable hockey stick models. The average global temperatures over the last ten years were showing a cooling trend, but I have discovered that this is because night-time temperatures were showing a downward bias. I have now removed them and I can now report out-of-control warming of the planet. It’s worse than we thought. Maybe someone needs to sit in the middle of the ocean reading a newspaper and drinking a cup of coffee in the middle of a storm so we can get some accurate readings. Stupid question here, but wouldn’t increased sea temps be indicative of the oceans releasing heat into the atmosphere and therefore cooling? Does anybody know how much of the SST changes over the last 2 years was caused by the wind blowing, or not blowing, icebergs out of the arctic? I would expect more icebergs going south would lower SST, while fewer bergs would allow SST to be higher. Would the effects last more than just the one season. Doesn’t really matter that much, whether its the warmest on record or not. There is an uptick, but when the pacific ocean is going through an el-nino, and it spans 1/3 the globe… one would figure the global sea surface anomaly to be affected. In short, this argument is meaningless from all sides. As a believer, you cannot use it to demonstrate anything of value with regards to global temperature. As a skeptic, you cannot use it to demonstrate any real problem with data since all the data sets show an uptick (and expectedly so). Nobody in their right mind, or rather, no HONEST scientist would make claims of record temps after discarding a dataset that shows otherwise. And really, I personally don’t get concerned if temps go up or down. We’re well within the range of expected, normal variation. Anyone hyperventilating in either direction doesn’t understand variability. Graph paper? It’s simply a standard time series graph that’s the output of EXCEL. I prepared it, not they. Jeremy: I agree with much of your 10:55:07 comment. This is much ado about nothing. The multiyear and multidecadal changes in Global SST anomalies appear to reflect the ocean’s ability to integrate ENSO. No it is not meaningless. When a trusted government research organisation at one time merges data sets to get the desired trend, and later removes one of these datasets because “it showed less of a trend”, then It is not what it tells us about climate change so much as what it tells us about NOAA that this story is about. Nothing stupid about it. Ocean heat content rises during La Nina events and decreases during El Nino events. It’s easy to see in a comparison of NINO3.4 SST anomalies and the OHC of the tropical Pacific. Just a funny comparison for me… I got my M.S. in criminal justice, and one of the big problems that has occurred is how police departments across the country record crime numbers. What cheifs and politicians like to do is start recording crimes more stringently when they are going to start a new program i.e. community policing and then once they get the funds for said program begin “down grading” crimes. For example, if I stole a $1100 TV, they would report that as a financial loss of $700, so that it would reflect misdemeanor theft rather than felony theft. So in 5 years, they can show their amazing graphs showing how their program fixed the crime problem. If you really want to get depressed, check out what happened in Philadelphia in 1953. Not having M$ EXCEL, I hadn’t realized it was their standard output. But I’ve seen those types of graphs before, and I agree with George. Of what use are the lines? E.g., what are the anomalies in 1996 on Figure 6? The addition of satellite data caused problems for many of our users. What problems for which users I wonder? Ummm… do we only have 30 years of data? You have such a good grasp of things, and you are FAST on the “uptake” for various concepts, so I’m going to propose something here which I think needs to be considered. website and find that the IR energy balance has been “negative” for some time. In any case, I have also asked Dr. Spencer if there is something to cause the oceans to become transitorily better absorbers. He has not had a chance to think this out (he really is a great THINKER and doesn’t respond “off the cuff” much of the time, because what he responds has THOUGHT and EFFORT behind it!). But my (superficial) analysis is this: High sea surface temps = result of greater ABSORPTION around the globe. Accounts for negative energy balance currently observed. Now here’s the kicker: This does not mean higher atmospheric temps.! Because there is a LOT of ocean out there below the “sea surface temp” region. Thus a LOT of “thermal well”. Our current energy input to the sea surface could, and probably WILL be “swallowed up” by the oceans. SO what we may have here, in the long run, is an even GREATER model/example showing the DOMINATING effects of WATER on the atmosphere, and the trivial nature of CO2. Water both in the vapor form and in the LIQUID form. The bias was strongest in the middle and high latitude Southern Hemisphere where in situ data are sparse. First use the need to measure temperatures where there is data missing to fund a satellite instrument, then when it disagrees with your biases claim that the data can’t be used because there is no other source for the data. Something wrong here. Can they get better results getting Salvadoran teenagers to measure the temperature? Has anyone requested details on that claim? FOIA on the communications? This post discussed peak SST and SST anomalies. With that in mind, there actually was no need to go back any further than 1997. I started in November 1981 because the OI.v2 SST data is satellite based and has only been available since November 1981. Since that was one of my primary datasets for comparison, I elected to use its time span. Kelvin waves are a part of El Nino. They start out warm, throw that warmth into the air, and end with a cool tail as they propagate across the ocean. Kelvin waves are a good way of understanding that El Nino’s throw heat out of the ocean while La Nina’s hold it in under cool upwelled surface water. Kinda like a heat inversion where colder air above keeps warmer air trapped below. Higher highs = bull market on for AGW PR and propaganda. That’s the main significance of the press release, imho. NOAA seems to be following GISS with the higher highs. Those pesky satellites aren’t confirming, though. Had the satellite data showed warming then they would have left it in the results for sure. This is a sensible comment, given that we have data to support this conclusion. This is speculation, and thus less conclusive/believeable in the absence of further evidence. My opinion/suspicion is that NOAA (along with other government agencies) are understaffed and overworked and are doing the best they can. The news release is expected, because all government agencies have to do such things in order to show that they are (supposedly) doing something useful. The quality of the content of these news releases varies. THE RESIDAL BIAS LED TO A MODEST DECREASE IN THE GLOBAL WARMING TREND AND MODIFIED GLOBAL ANNUAL TEMPERATURE RANKINGS. 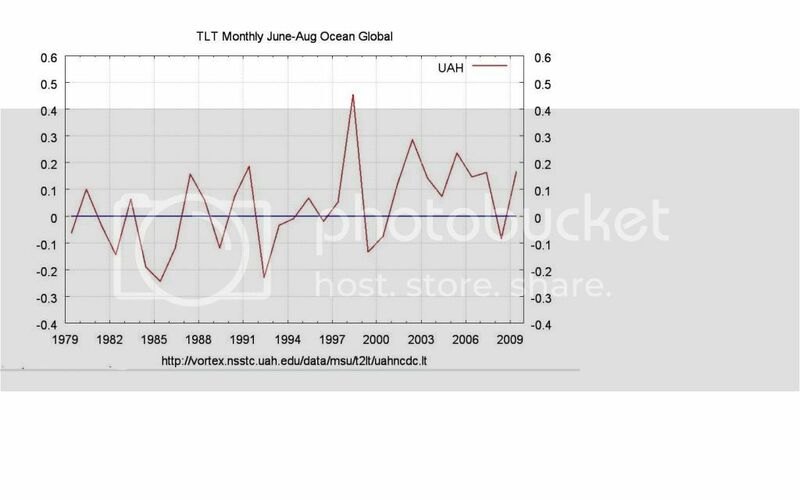 The claim that there’s record SST’s also doesn’t appear to be supported by Unisys either unless there was a massive dropoff in the last month. It’s interesting to note that the general picture of Unisys seems to be a little cooler than NOAA SST’s. It also shows negative anomalies trying to make their way into the ENSO region, something which does not show at all on NOAA’s TAO site. I don’t think I said anything about them being non-Cartesian; but I am used to graph paper where the grid lines represent equal increments of whatever the particular variable is. So in the case of fig 1, 1980 to 1985 five year interval is divided into four segments of 15 months each, while the 1985 to 1990 five year interval is divided into three segments of presumably 20 months each; in fact no two five year intervals seem to have the same scale. Now the only variation on this habit I am aware of is when the scale is divided into equal increments of some well defined function of the axis variable such as the base 10 logarithm for example. If you are happy with your Cartesian graphs being plotted on randomly scaled axes plots, that’s fine with me, but most of us are used to having axes with meaningful scaling; the main idea being to allow for extraction of data; including but not limited to the timing of significant events. I’m not sure I understand your argument, but to clarify, are you saying there is ‘missing’ IR which is going into the oceans due to some unknown transitory effect? Otherwise, energy is never ‘swallowed up’ by the oceans. Energy (heat) flows from the oceans into the atmosphere. Additional energy in the oceans will eventually be released into the atmosphere, all else being the same. ENSO is known to have substantial effects on tropical ocean biology. It’s possible that biological effects are large enough to effect the (average) depth at which sunlight is absorbed in the ocean, and hence effect SSTs and the rate heat (from sunlight) is released to the atmosphere. My understanding is that the reason ocean absorption of IR is minimal is due to the physical properties of water. I don’t see how a transitory effect could change this. Well I just did a little experiment; i measured the text in my today’s news paper, and it was about 50 mils tall 1.25 mm (San Jose Mercury News). So from 1.25 metres away, that is one milliradian subteded angle, which is 206 arx seconds. At 1.25 km away, make that one micro radian, or 0.206 seconds of arc. At a satelite height of 12.5 km, which would be a burn up in the atmosphere, the angle is 0.0206 arc seconds, well beyond the resolution of any through the atmosphere optical transmission, and at 125 km height, a possible altitude for a very short orbit life satelite, you would have a resolution of 0.2 milliarc seconds for the print to take up a whole pixel. So nyet on your statement; nobody has ever had such satelite snooping capability; hey they might be able to see that you appear to be holding a newspaper, but they could read nothing on it. George; who doesn’t like exaggerations; even for effect. Let’s see… how can we get back to our global warming charts??? Yeah, let’s take these satellite data out… still not enough… let’s now remove those years… yes, we are getting there… ok, we will now square 1997 and repeat that we now have a full El Nino event even if the map is mainly yellow and blue with only tiny bit of red… WE HAVE IT FOLKS!!! Now let’s publish this result for August. Thanks for Dr Tisdale. It looks like we need to take some “spin” out of the data. Now if someone can let Climate Progress know. They are doing cartwheels on the nearing of the endtimes unless we tax everyone one till it hurts. Well thanks Bob; actually I subsequently guessed that the actual graphs migh be your plotting of their data. But what happened to the minor grid lines; am i just seeing them faded out, and not printed; or what. And no disrespect to you was intended; reason for question on raw data, was to learn how many data points were actually available for each “cycle” of that weird fig one paired cycles graph. To what do they ascribe the fact that one cycle has a big swing, and the next just a minimal p-p range ? The later graphs such as 4/5/6 I have no probelm with other than the minor time increment lines, but #s 1 and 3 both have that strange look about them; that is hard to equate to more or less random data. Thanks for the link, I’ll go look to educate myself. From 2008, “NOAA’s total budget is $4 billion, with $1 billion of that going to all weather-related agencies”. I don’t think funding is the issue. Click on the graph to view a larger image. It’s an image scaling/resolution thing, not an axis scaling thing. When I asked in the other thread if satellite SST data was removed, I was referring to whether it was removed from the ERSST data set last November. In other words, did the removal affect only this year, last year or the entire record? The death of the scientific method. Forget looking at all the data, choose this one as it confirms my feelings. NOAA have thrown away the trust in scientific objectivity and have reverted to faith. I do not understand why so many of you are compaining about the graph! is linear, nothing important is missing. I can make sense of it. Question for you experts out there. If higher sea surface temperatures generate tropical storms/hurricanes then where are they? I should point out that, as I do every hurricane season, I watch what the Inter-Tropical Convergence Zone (ITCZ) does, because the further north it is the more Atlantic storms develop. This year the ITCZ has stayed well to the south. May the prevailing winds and the jet stream be having an effect that kept the ITCZ closer to the equator? Or is it possible the surface temperatures went up later in the year? Or perhaps a combination of these events? The minor grid lines appear fine to me. The graphs are reduced in size here at WUWT, which is one of the reasons I provide the direct tinypic links for the full-sized versions after each graph. The title blocks and the text in the post for Figures 1 and 3 state that they are SST data (not SST anomalies). The title blocks and text in the post for Figures 4, 5 and 6 state that they are SST anomaly data. George, “they” don’t explain the data. But here’s a similarly sized NINO3.4 SST anomalies graph for the same time span. Are you seeing the effects of ENSO? I don’t understand it either. There are links to the full-sized graphs after each one. DR: You asked, “When I asked in the other thread if satellite SST data was removed, I was referring to whether it was removed from the ERSST data set last November. I misunderstood because in the other thread you had asked if they deleted the OI data. I would assume that the removal of the satellite data from ERSST.v3b should only have impacted the satellite period from 1981 to present. However, there were also other changes made between ERSST.v3 and ERSST.v3b well before that period that have not been explained. There’s no Dr. before my name. Just Bob before the Tisdale. Your monitor resolution is screwing them up look at them at a lrger magnification. Yup, makes all the difference. Thanks. When the length of observation is as short as that provided by satellites, and the monthly anomalies are as choppy as they are, any monthly record is hardly meaningful. Although Ashville claims this to be an all-time record, they don’t have the global data coverage prior to satellites to back up such a claim. First, let me say that I am a climate skeptic. Let us put aside whether August 2009 is a SST record or not. I doubt that it is, but no matter. Is it “almost an SST record” after all the relevent data is included? If so, is this surprising given the relatively weak El Nino in August 2009? What will happen as El Nino strenghens, as is predicted by NOAA? Is this warm SST surprising, considering the quiet Sun? These are honest questions for discussion, if there is any interest. When do we expect SST’s to start falling again? P.S. Examining the huge short-term fluctuations in air temperature, sea surface temperature and atmospheric CO2 concentrations, it is apparent that natural short-term fluctuations are several times larger than any possible human impact. Detecting an actual human component in this data would not be easy, if it even exists at all. Synopsis: El Niño is expected to strengthen and last through the Northern Hemisphere winter 2009-2010. A weak El Niño continued during August 2009, as sea surface temperature (SST) remained above-average across the equatorial Pacific Ocean (Fig. 1). Consistent with this warmth, the latest weekly values of the Niño-region SST indices were between +0.7oC to +1.0oC (Fig. 2). Subsurface oceanic heat content (average temperatures in the upper 300m of the ocean, Fig. 3) anomalies continued to reflect a deep layer of anomalous warmth between the ocean surface and the thermocline, particularly in the central Pacific (Fig. 4). Enhanced convection over the western and central Pacific abated during the month, but the pattern of suppressed convection strengthened over Indonesia. Low-level westerly wind anomalies continued to become better established over parts of the equatorial Pacific Ocean. These oceanic and atmospheric anomalies reflect an ongoing weak El Niño. A majority of the model forecasts for the Niño-3.4 SST index (Fig. 5) suggest El Niño will reach at least moderate strength during the Northern Hemisphere fall (3-month Niño-3.4 SST index of +1.0oC or greater). Many model forecasts even suggest a strong El Niño (3-month Niño-3.4 SST index in excess of +1.5oC) during the fall and winter, but current observations and trends indicate that El Niño will most likely peak at moderate strength. Therefore, current conditions, trends, and model forecasts favor the continued development of a weak-to-moderate strength El Niño into the Northern Hemisphere fall 2009, with the likelihood of at least a moderate strength El Niño during the winter 2009-10. Expected El Niño impacts during September-November 2009 include enhanced precipitation over the west-central tropical Pacific Ocean and the continuation of drier-than-average conditions over Indonesia. Temperature and precipitation impacts over the United States are typically weak during the Northern Hemisphere summer and early fall, generally strengthening during the late fall and winter. El Niño can help to suppress Atlantic hurricane activity by increasing the vertical wind shear over the Caribbean Sea and tropical Atlantic Ocean (see the Aug. 6th update of the NOAA Atlantic Seasonal Hurricane Outlook). This discussion is a consolidated effort of the National Oceanic and Atmospheric Administration (NOAA), NOAA’s National Weather Service, and their funded institutions. Oceanic and atmospheric conditions are updated weekly on the Climate Prediction Center web site (El Niño/La Niña Current Conditions and Expert Discussions). Forecasts for the evolution of El Niño/La Niña are updated monthly in the Forecast Forum section of CPC’s Climate Diagnostics Bulletin. The next ENSO Diagnostics Discussion is scheduled for 8 October 2009. To receive an e-mail notification when the monthly ENSO Diagnostic Discussions are released, please send an e-mail message to: ncep.list.enso-update@noaa.gov. I’ve just noticed that the ERSST.v32 and the ol.v2 datasets have a strong seasonal signal. According to them, average SST increases by 0.5C from NH winter to NH summer. Which is strange because the SH has a lot more of the world’s oceans than does the NH, and consequently a seasonal signal should be in the opposite direction. Which makes me think, there are large hemispheric biases in these datasets. I see a steady, long term temperature rise in all the graphs. What causes the “steady, long term temperature rise” you see? bugs, you see a small short term rise (30 years) in temps. The question is, do such rises of such duration come and go historically? Is there anything unusual or alarming? Or is this like looking at the period June-October and saying that you see a definite steady decline? Without realizing that the climate is seasonal? I don’t know. But I don’t think there is much point getting too worried about small 30 year trends UNLESS there is evidence something unusual is going on in a timescale of centuries or millenia. Well OK now I can see the lines. I have a 24 inch diagonal monitor that is 1920 x 1200 resolution and if I need more than that I am in trouble; but I guess WUWT is eliminating them; a classic case of a Nyquist violation, if I ever saw one. Sorry Bob for all the wasted fuss. Hey, I think I am now catching on to this stuff. Now that I have my grid lines back, I can see that the “global SST” graphs (1 & 3) have a big dip almost right on the year lines, and a small dip half way in between; so can I conjecture that the big dip is the SH winter, and the little dip, is the NH winter; winter in this case being defined as the time of lowest SST (locally). And yes I would expect the anomalies to wander aimlessly around as they seem to. Dang it is hard keeping up with you guys. Of course I’m still not sure what it all means, since everybody seems to have his favorite data set. Hey I like Gaia’s data set; she gets it all right everywhere all the time. Gaia is a really great exeperimental climatologist. Not sure if I am splitting hairs, but when I look at fig 6 in the full scale blowup, on my screen the red and the brown lines are not the same shape; they appear different in other than vertical placement. Not much but not visually identical. So why does the choice of baseline change the data, other than by shifting every data point by the difference between the two baseline numbers, each of which presumably has some finite number associated with it, and therefore the difference ought to be a simple y-axis shift; shouldn’t it ? Yes, Bugs, no one debates that temps in the last ten years have been hotter than the previous 20. However, temps in the last 10-13 years haven’t changed much, and seem to be on a declining trend, which frankly, worries me a good deal more than any warming. In many areas, average temps increased by up to 2 deg in the 1920-1940 period. So did the polar bears die? Was it a catastrophe? Doesn’t seem to have been. Why then, if allowing it would happen, would another 2 deg matter now? What’s different from 1920? Is there something ‘special’ about current temperatures? OT: Am I missing something, or are there only four posts on Real Climate in the last month? Is anyone manning the barricades? “The addition of satellite data caused problems for many of our users” hillarious! The data was inconvenient so they “adjust” it to please its users – They seem to only want to support their ideas rather than actually understand how the climate works and follow the principles of science! Yes, Bugs, no one debates that temps in the last ten years have been hotter than the previous 20. Is this whole surface stations project a waste of time? REPLY: Is determining the quality of any set of measurements a waste of time? The big dip is NH winter. Schmitz-Hubsch, H.; & Schuh, H. (1999). Seasonal and short-period fluctuations of Earth rotation investigated by wavelet analysis. Technical Report 1999.6-2 Department of Geodesy & Geoinformatics, Stuttgart University, p.421-432. Y.H. Zhou, D.W. Zheng, & X.H. Liao (2001). Wavelet analysis of interannual LOD, AAM, and ENSO: 1997-98 El Nino and 1998-99 La Nina signals. Journal of Geodesy 75, 164-168. Each month gets a different average when you change base-periods …so it’s not just one shift of the whole curve, but rather 12 shifts. Funny how we are expected to ignore 30 year warming trends but jump for joy at the current two year trend of Artcic ice extent. So let’s also ignore the 30 year trend and look at the 100 year or even 200 year trend. And if we are to accept that temperatures should be expected to rise with the current weak El NIno why should we not also expect temperatures to cool after the strong El Nino of 1998? I can’t get my head round that one. In my opinion it’s time the cherry pickers and nit pickers packed it in and looked at the long term benefits of global warming. The opening up of the North East passage and possibly soon the North West passage to commercial shipping will be immensely valuable to global trade. And look at all that fertile frozen land in Canada and Russia ready for cultivation. What interests me is that there clearly has been a significant rise since 1980, and that it is not simply turning right back down although we know the Sun is in a blue funk and land temperatures are down. These graphs are an easy message for warmists to interpret as “it’s obvious” etc. But I want to look at another factor: slow thermal inertia buildup effects from the ocean. This also shows up IMO in Ferdinand Engelbeen’s observation that although recent Greenland summers have been cooling, the Greenland mean temp has not really changed. So that when the Sun starts to “cool” the cooling surface is still overbalanced by the ocean depths returning the signals of warming. Like Akasofu described in his pic of a 60-year (?) cycle overlaying a steady return from the Little Ice Age. We know that the ice cores show CO2 changes lagging temperature changes by ~800 years which would seem to correspond to the thermal inertia effects of the global thermohaline current. Thanks Bob for the link. In summary, the NH has a much greater annual temperature range (14C) versus 7C for the SH because of the larger landmasses. This results in a large SST annual range in the NH mid lattitudes off the east coast of the continents and in the semi-enclosed seas like the mediterranean. I assume this is due to greater ocean cooling by westward moving cold air masses in winter. In which case, NH SSTs should on average be significantly colder than SH SSTs, especially given the fact the SH gets 5% more solar radiation than the NH. In fact the opposite is true and SH oceans are colder at all lattitudes. Which means NH continents must have a large warming effect on the oceans in summer, which I understood was physically impossible. Or maybe it’s reduced ocean cooling in NH summer. I realize I am getting off the seasonal signal in SSTs. Just trying to understand how it all works. i was cooking tea tonight . I put some fat into my frying pan put the pan on the element truned the power on .After about 3min the fat started to melt. I turned off the power after 6min and the fat still was melting . It was about 30min after i turn the power off that the fat stoped melting and started to harden again.It was back to it normal state in about 70min . It will get warmer – but I don’t think it will strenghten too much. Not for me as I don’t believe fluctuations in the sun’s activity have much effect on the earth’s temperature. We’re a long way into this minimum and there’s been no discernible change. Peak activity was in the early 1990s. SC23 was nothing to shout about yet the warmest years have all been recorded during that cycle. Following the 1940s PDO shift the temperatures dropped fairly quickly. By 1951, most of the cooling had already taken place. We need to face up to the fact that a (possible) CO2 signal may reveal itself in the coming years. Minor warming of .15C since 1979 from UAH but of course this is satellite based and unused by the BIASED scientists at NOAA, and that is the only way to explain their exclusion of data that shows a “cooling bias”, because they are biased against cooling. However people still get alarmed even if there is minor warming, as if the earth is supposed stay static year after year, century after century. AGW skeptics admit we are warming, but we choose to stay focused on natural global factors rather than blaming man. The CO2=heating crowd does not want to understand that our planet had much higher levels (+1000ppm) of CO2 in the past and the earth did not burn up, there is no corellation to heat. People also dont realise that we have had polar ice caps for about 20% of the planets history, instead they are ready to panic when the icecaps go into their normal seasonal melt. This realease by NOAA is just fuel ahead of the upcoming Copenhagen conference and to support the presidents speech next Tuesday. They have an agenda. And the fact that people wait breathlessly for the next release of 30 days worth of temperature data shows they have no concept of the age of our planet and the relative significance of 30 days, 30 years or even 3,000 years. I hope you don’t mind Anthony. I posted this in an earlier thread but I see you have moved on. From the NOAA press release, just in time for Copenhagen. Expect more research corruption and spin as the Copenhagen free loaders convention draws near. What the NOAA data distorters didn’t want you to see. The June-August worldwide ocean surface temperature was also the warmest on record. Only if you remove this. Mark: Regarding your 02:19:58 comment, let me switch topics to Ocean Heat Content (OHC) for the tropcal Pacific to illustrate a point. The following is a comparison graph of the tropical Pacific OHC (from the Levitus et al 2009 dataset) and NINO3.4 SST anomalies. I’m using the latter to illustrate the timing of El Nino-Southern Oscillation (ENSO) events. The major swings in OHC in the graph are primarily responses to El Nino events, during which the tropical Pacific discharges heat, and La Nina events, when the tropical Pacific recharges. There is also a recharging of the western tropical Pacific during the El Nino, and this occurs while the eastern tropical Pacific is discharging heat. The recharging occurs due to shifts in cloud cover, allowing more downward shortwave radiation (visible light) to enter the tropical Pacific ocean. An example: Those swings in downward shortwave radiation from shifts in cloud cover can be as high as 25 watts/sq meter. Now, I don’t know how much of the 11-year cycle in Total Solar Irradiance (TSI) is made up of visible light, but those variations in TSI are only 1 watt/sq meter. Also, if you were to examine the other subsets in the linked post, you can see how El Nino events shift heat around the nearby oceans, causing step changes. – You’d expect temperatures would have peaked in the early 1990’s which just might have happened had it not been for Pinatubo. Of course there are other factors in play (ocean thermal lag, PDO/AMO, El Nino’s and La Nina’s) but the bottom line suggests that focusing on a solar peak in the early 1990’s is the wrong perspective. Given that CR levels are still at low levels not seen since the Oulo record began, I would expect more cooling once the current El Nino fades. After all we hit a UAH anomaly of zero in June before the El Nino kicked in! Interesting looking at the graphs and seeing SST peaks at N.H. summer and notches at N.H. winter. I might have guessed it would have been the other way round with so much ocean in the S.H. Thanks for the clarification Paul, and the nifty links; but now I am totally confused. I thought that instead of recording real temperatures (like in Kelvins or even deg C) that Climatologists like to plot anomalies, being the difference between the actual measured (anomalous) temperature, and the “correct” temperature that it was supposed to be based on the average over some 30 year time period (base period). If I understand what you seem to be saying now, is that the current temperature is essentially compared to what it was on the corres[ponding day some arbitrary time from the past, and that the “expected” true val;ue changes for each data point, daily, weekly monthly annually or whatever. Why on earth would anyone suppose that the sequence of actual temperatures from some past era was in any way “normal” ? No wonder it is impossible to relate any of this temperature data, to thermal energy flows, or air/ocean mass flows that result from real time temperature differences across the planet. The whole thing sounds to me like an exercise in self flaggelation. And I’m still puzzled; the SH is mostly oceans, so it has the most sea surface area. The earth is further from the sun in SH winter, so SH winters are colder; so if I have more sea surface, and presumably colder sea surface, than in the NH, how could the global average be colder in NH winter ? That just does not seem to compute to me. I’m not suggesting it should have an instantaneous response – though in some of the solar/climate reconstructions the response is pretty near instantaneous, and in the case of the Dalton Minimum temperatures actually fell before the DM started. The so-called link is iffy. 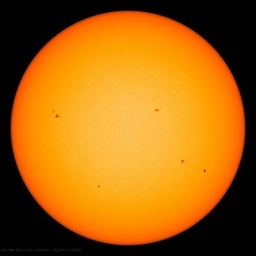 The Little Ice Age is supposedly due to low solar activity. If true, then the LIA should be clearly defined – except it’s not. There is no firm agreement when it started or when it ended. Svensmark appears to be the last throw of the dice. But the trend in GCR is just not there. Ok there has been a slight rise in recent years but the GCR plot looks absolutely nothing like the surface (or satellite) temperature plot. What are the cumulative values as a percentage of the average values. I suspect some selective scaling has gone on here. I’m not convinced your link means very much. An anomaly of zero simply means the average temperature for June in the 1979-1998 period. Also, bear in mind that there appears to be an odd dip in May/June anomalies in the UAH record. John Christy has posted on this issue on WUWT. In any case, any temperature dip was due to the lagged response to the near La Nina conditions a few months earlier. Where does this come from? The least sq trend for UAH since 1979 is ~0.13 deg per decade or a ~0.4 deg total warming over the period of the record. They’re trying to ‘remove’ the dominant annual cycle, but in order to do so they are stuck with the untenable assumptions of (a) cyclostationarity and (b) a lack of shared variance with other temporal modes of variation (some of which might be nonstationary &/or conditionally periodic …&/or have periods that are incommensurate with the annual period at the base-period timescale, etc.). Interestingly, they use a different approach to ‘removing’ the diurnal cycle (averaging TMax & TMin instead of subtraction of time-of-day normals). Cultural conditioning seems to lead to unquestioning acceptance of assumptions. The different methods of ‘removal’ of dominant cycles have consequences for some types of analyses, but in my experience people tend to shape their beliefs about assumptions around what they’ve memorized rather than around conceptual understanding at a fundamental level. Ok – when was it? Define the period for the LIA. John Finn: I am referring to the below graph John. I did not do a least square fit but after 40 years the temp. anomaly is currently .2C from the average. A straight line fit to the data gives about .15-.2C departure from the average over the time period. At 0.13 deg per decade the total warming over the 30 year period is 0.39 degrees. GISS, Hadley and RSS show ~0.5 deg warming over the same period. I understand that the system is complex, with many lesser cycles that interplay with longer cycles, and that examining the ancient records does not produce a clear fit by displacing CO2 by 800 years, but only a best fit. I put it all here. Can you suggest an improvement of my statement there? I’m not able to do statistical analyses myself but I’d be interested to hear more about your non-random distribution. Anyway, I made the point to emphasise other evidence for thermal inertia effects of the oceans. Journal Publications webpage has links to more than 90 papers, many of them covering SST variability and the impacts of atmospheric circulation on SST. Without having seen the raw data, it strikes me that each of the graphs is showing the same pattern. Split the graphs into two parts 1981-1997 and 1998-2009. If one draws the single best fit line from 1981 to 2009 one has an upward slope, but if one draws the best fit line for 1981 to 1997 and then from 1998 to 2009 one obtains two horizontal lines. There is no distinct pattern of warming in either graph but the average in the second graph is significantly (?) higher than in the first. Hence pointing to a step change in 1997/8 rather than to a pattern of consistent warming over the period 1981to 2009. Wang, C.; Lee, S.-K.; & Mechoso, C.R. (2009). Inter-hemispheric influence of the Atlantic warm pool on the Southeastern Pacific. Journal of Climate, in press. Looking at the seasonal variation element in the length of day (LOD) analyses, and the global sea ice record at Cryosphere Today, gives the answer to the graph shape. I guess the annual shape (big trough, peak, small trough, peak) is not due to temperature variation between north and south, so much as area of ocean exposed by melting ice, which then gains a monthly SST value, and contributes to the long term mean. There is much more southern sea ice than northern to disappear, leaving a large area of cool ocean. What used to be persistent Arctic ice is now in a grey area as far as gridded temperatures are now concerned – it used to be perhaps thought of as land, and now it is sea, as Paul says – “a shape-shifting continent”, or alternatively, a shape shifting ocean. Of course, all this seasonal signal disappears when the anomalies are plotted, only the trend and noise remains. The trend will of course change slope when the last few years of low northern sea ice cover SST measurements get included in the comparison baseline period, unless there is a convenient reason to “correct” for diminishing Arctic summertime ice cover. Hi Lucy, My comment is about lags in general. As for the bit about “non-random”: Too many people are eager to cut-corners with untenable assumptions of randomness. (The discipline of statistics needs to keep itself highly-valued – we should all understand their need to market the dogma, which floats on a raft of assumptions and only rests upon a solid foundation in the abstract (i.e. imagination). The stuff can be useful for some purposes, but it isn’t necessarily the best way to make decisions about geophysical phenomena that are not well-understood.) To keep this exchange practical, I suggest using qualifiers like “roughly” & “generally” to deflect potential criticisms. Thanks for the notes – in particular the note about southern ice. Chris, I dug around to find some Sea Ice time series. When I compare them with LOD I find that generally LOD leads by about a month. The factors affecting LOD (e.g. AAM) appear to go beyond just sea ice. This exchange has been helpful in sharpening holistic perception and developing new questions. Most of the seasonal (pattern) and intraseasonal (noise) (as remarked in the Zhou et al paper on LOD, AAM and ENSO you quoted in an earlier post) is said there to be due to atmospheric interaction with the “solid earth” – The definition of which might include 100% sea ice, but probably not 15% concentration used for sea ice extent data. On the other hand, even loosely packed ice at the poles is different from melted ice or water vapour in terms of its effect on the total angular momentum of the earth. The temperature of, and the latitude where the water is massed is also important regarding the velocity of the earth’s rotation. Zhou, Y.H. ; Yan, X.H. ; Ding, X.L. ; Liao, X.H. ; Zheng, D.W.; Liu, W.T. ; Pan, J.Y. ; Fang, M.Q. ; & He, M.X. (2004). Excitation of non-atmospheric polar motion by the migration of the Pacific Warm Pool. Journal of Geodesy 78, 109-113. Yan, X.H. ; Zhou, Y.H. ; Pan, J.Y. ; Zheng, D.W.; Fang, M.Q. ; Liao, X.H. ; He, M.X. ; Liu, W.T. ; & Ding, X.L. (2002). Pacific Warm Pool Excitation, Earth Rotation and El Nino Southern Oscillations. Geophysical Research Letters 29, 15685-15690. Also, see the works of Yu.V. Barkin. Thanks for those links, Paul. I believe Nikolay Sidorenkov’s monograph “The Interaction Between Earth’s Rotation and Geophysical Processes” has now been published. I must order a copy from the library. What if LOD lags AAM by eleven months? Second correction: Paul notes that there is a 1 month lag between sea ice extent and absolute LOD measurements. Lehmann et al. (2008) note that LOD lags AAM by one month. Therefore AAM = sea ice extent?, or is there a different temporal relationship? Warmmmmmmmmest oceannnnnnns in 120 yearrrrrrrrrrs! Chris, I’ll give the lag-patterns further consideration moving forward. Interesting notes in there about LOD-AAM contrast patterns …more questions arise. I’ve never calculated absolute AAM from scratch, but if non-directional moduli are involved, that could be a clue about the El Nino vs. La Nina difference. Have you read Barkin? Please update us if/when you find the new Sidorenkov work – thanks. Paul, when these threads get pushed down the list, they begin to be like private chats! The price is a bit steep for me, but I will order it from my public library. As for Barkin, I’ve read “UNITY OF RHYTHMS OF EARTH ROTATION, GRAVITY AND GEODESY VARIATIONS: THEIR NATURE AND INVERSION PHENOMENON”, he has papers on many aspects of planetology – have you any specific recommendations? The difference between the observed and theoretical curves again shows the pattern we discussed above. There is however a move away from core-mantle-lithosphere differentials (which are not directly measurable) to surface hydrosphere-cryosphere-atmosphere interactions (which are becoming more so) affecting the rate of the earth’s rotation. However there is something wrong with the calculation – about 2billion years of history is missing. Could that be accounted for by losing a liquid ocean to either a vapour hothouse or Ice snowball? Enough of gravity for now. One more effect of sea-ice caps is the temperature of the overlying atmosphere, and thus the composition of gases, and the overall density of the polar atmosphere. Under the coldest conditions over the Antarctic (and probably over the Arctic in winter), there is almost no water vapour nor carbon dioxide – no greenhouse effect, and there is also the ozone hole, so there is effectively no restriction on OLR, and no heating of the atmosphere by infrared. The ozone hole also represents a local increase in TSI, in the form of short-wave UV reaching the surface. This may just be reflected by snow and ice, but must be absorbed by the southern ocean. Barkin’s attention has drifted towards the hydrosphere & the atmosphere in his more recent work. I’m hopeful that he will carry on with that theme, but I suspect he is running into some very formidable mathematics as he strives to overcome unrealistic conventional assumptions. I need to find some time to go back through his papers and make some notes — if/when I manage to do so I’ll probably share here at WUWT. Thanks for sharing the notes Chris. I will be pondering your suggestions about sea ice. I look forward to exchanging further notes in future.